Tony Faust's Oyster House and Restaurant, at the corner of Broadway and Elm Street, closed June 30, 1916. It has been 100 years since a lavish downtown restaurant closed, signaling the end of an era in St. Louis. On June 30, 1916, Tony Faust’s Oyster House and Restaurant gave its final last call, after four decades of serving as St. Louis’ social epicenter — for the rich and famous and working class alike. 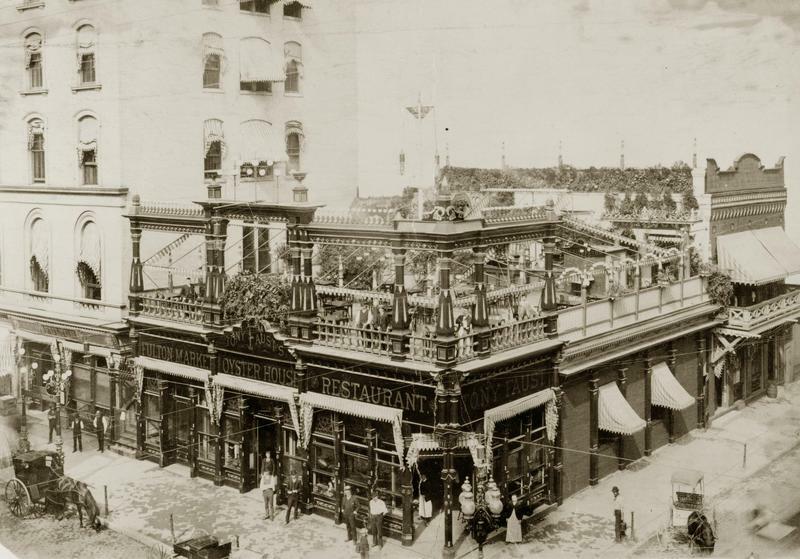 Faust’s restaurant at Broadway and Elm Street was renowned for extravagant meals, rooftop dining and being the first in St. Louis to offer electric lighting. Notable regulars included beer baron Adolphus Busch, who lunched there almost daily, along with other leading businessmen, at what was known as the “millionaires table.” It was also a go-to destination for notable authors, athletes and dignitaries staying at the adjacent Southern Hotel, as well as actors and crowds from the nearby Olympic Theater. The restaurant drew on the German roots of its proprietor, who was adored by many and regarded as one of the country’s first celebrity restaurateurs. “I think one of the largest reasons for Tony Faust’s restaurant having such popularity is because of Tony Faust himself,” said local historian Elizabeth Terry, author of Oysters to Angus: Three Generations of the St. Louis Faust Family. 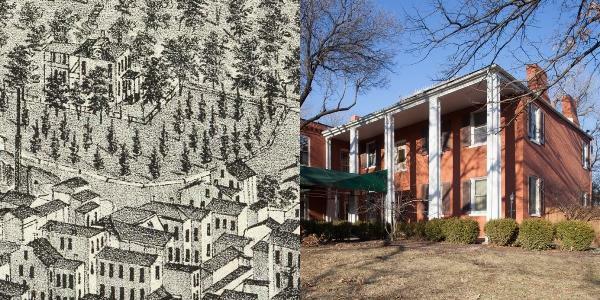 The Gilded Age institution, however, succumbed to a familiar westward trend in the St. Louis area, said Andrew Wanko, public historian for the Missouri History Museum. Wanko explained that Faust’s restaurant business declined as the city’s growth and wealth shifted toward Midtown and the Central West End. Terry said even after its closing, Faust’s restaurant has left a lasting impression on St. Louis. The restaurant was demolished in 1933. The Stadium East parking garage near Ballpark Village now stands in its place. Faust’s legacy lives on in many ways, including in Chesterfield where his descendants donated 200 acres of family land to create Faust Park. 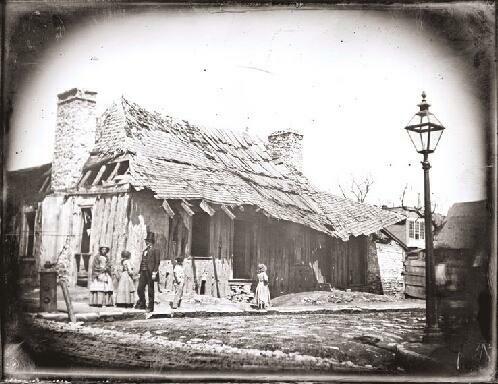 Many of St. Louis’ buildings have been lost to time, disaster, or destruction. It may seem like an inevitable byproduct of progress, but what do we lose when we lose a historic building? “Sometimes what we lose is so much more than the physical structure, it’s our collective, shared memory,” said Andrew Wanko, public historian at the Missouri History Museum, in a conversation with “St. Louis on the Air” host Don Marsh on Tuesday. "Lost Buildings of St. Louis" is a new exhibit at the museum that shares the stories behind many of St. Louis’ lost buildings. This article first appeared in the St. Louis Beacon: Bob Cox, a former senior vice president at Emerson, has been named interim president of the Missouri History Museum, starting on Monday. Cox, whose job will be part time, is expected to serve until the museum selects a permanent replacement for Robert Archibald, who resigned as president of the museum late last year in the wake of controversy over his compensation and the purchase of land for a community center that was never developed. The Missouri History Museum has unveiled a 6,000 square-foot exhibit that transports visitors back in time to experience St. Louis in 1875. The exhibit, “A Walk in 1875 St. Louis,” is a replica of Compton & Dry’s 300 square-foot “Pictorial St. Louis” map created in 1874 by Richard Compton, a St. Louis sheet music publisher, and Camille Dry, a mechanical draftsman.